By default, virtual machines located on VMWare ESXi (Free Hypervisor) or VMWare Workstation is not starting automatically at the host boot. This means that after the ESXi/ Workstation host reboot (planned restart or crash, for example, caused by a power failure), Administrator have to manually start all the virtual machines. 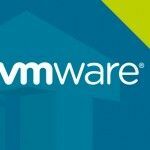 In this guide we will show you how to configure Autostart VM on the ESXi and VMWare Workstation host without Administrator intervention. 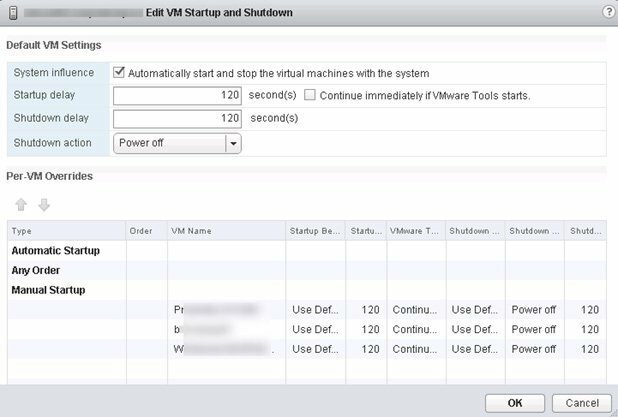 How to Configure VM Autostart on VMware ESXi? At first, open browser and go to the login screen page of the VMware Web Client and then log on. In Web Client console, select ESXi host which you want to configure for VMs autostart. Then go to following tab Manage > Settings > VM Startup/Shutdown. Tip. If your ESXI host is a part of vSphere HA cluster, you can’t configure VM autostart and shutdown settings this way, because HA cluster respond for the availability of VM. As you can see all of the virtual machines disposed on a given ESXi host are in Manual Startup section. This means that after host rebooting they will have to be started manually. In order to be booted automatically you need to add VMs manually to the Automatic Startup list. In the dialog Edit VM Startup and Shutdown check on Allow virtual machine to start and stop automatically with the system. It is now possible to configure the auto start settings for VMs. 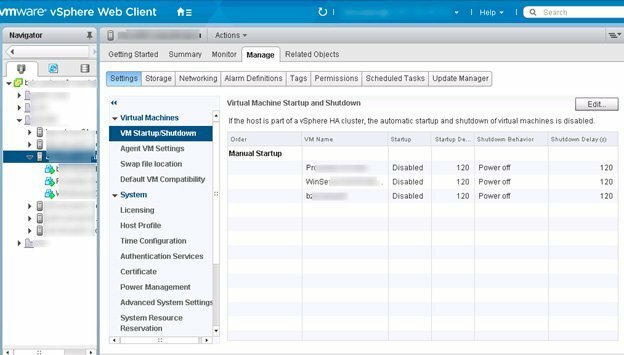 Shutdown Action — for each VM available 4 shutdown actions: None, Power Off , Suspend or Guest Shutdown (using opportunities of VMware Tools, that you need to pre-install in the guest operating system). Вy default used action is Power Off. Manual Startup — Administrator should start these VMs manually. Select desired virtual machine and use Move up button to move it to Automatic Startup section. Similar action is performed with all the VMs on the ESXi host. Tip. If you have not configured the HA, but it is possible to move VMs between hosts using vMotion, startup settings are migrating to the destination host with VM. That’s it! You have successfully configured automatic startup for virtual machines on VMWare ESXi or vSphere Center. In VMWare ESXi 6.0, there was a strange bug. Despite the fact that the autostart priority for virtual machines was configured, after the host server was rebooted, only the first virtual machine was automatically started. The second virtual machine stubbornly refuses to boot. To solve this problem, you need to enable SSH access on the ESXi and connect to the host using any SSH client (for example, Putty). As you can see, in this case, the first VM with ID 1 is set to autostart (startAction = “powerOn”), while the second one does not (startAction = “none). Make sure that the startAction value of the new VM has changed to powerOn. The desktop virtualization software VMware Workstation also does not provide the ability to automatically startup the virtual machines at Windows boot. To start the VM from the command prompt, you can use the utility vmrun.exe which is located in the folder with the installed Workstation. You can run any virtual machine by creating the following batch file AutoStartVM.bat. The second code line is used to create a 40 second delay before starting the second VM. This bat file can be put on the desktop (and started manually by double click) or added to the Windows Startup or run by task scheduler job. You can also convert your virtual machine to a Shared VM (VM > Manage > Share). Select in the main window Shared VMs > Manage AutoStart VMs. In the Configure AutoStart window that opens, you can choose which virtual machines will start with the host. You can also change the delay between the start of each virtual machine (in seconds). can this be done without vSphere or VCenter? I’m using the free ESXI license for my home lab, and I don’t have VSphere or Vcenter since those are not included. The Web interface lets me enabled autostart, and the guest actions also let you raise or lower the machine’s autostart priority. What it doesn’t let me do is it select which guests are included in autostart. I’ve searched all over the interface and cannot find it. Isn’t – Shutdown Delay – the maximum time the host will wait before it powers off the VM, and not “Specifies the time delay before shutdown each virtual machine”. I believe its documented on VMware’s website somewhere. It seems correct for us to say that if the VM shuts down before that delay time is reached, the next virtual machine starts shutting down. Good find and I was confused about the meaning as well. Was somebody able to clarify what the correct meaning of the Shutdown delay is?